Urgent message: In today’s rapidly changing and hypercompetitive business environment, you don’t have to “reinvent yourself” to become “indispensable.” Rather, you should focus on adding complementary skills to your current strengths. The unfortunate reality of today’s managerial world is that turnover happens all the time. Moreover, it happens quickly. Even if you have been successful in your current role, business can change in an instant—blink and you could find yourself without a job. Retaining a position as a manager takes more than having years of experience. Rather, it takes specific skills that must be grown and adapted over time to meet the time-sensitive needs of an organization. So, what’s the key to becoming indispensable? It’s complementing the things you already do well with new leadership skills. Good leaders understand that stagnation is a problematic trait in any organization. Stagnation slows down the entire operation and can be catastrophic if left unchecked. In the healthcare setting, it is all-too-easy to slip into a routine and become a stagnant leader. Urgent care owner/operators should both be aware of this and take steps to combat it. “Succeeding as a start-up founder increases the chance you’ll be fired—because, among other reasons, the skills required to scale a company are so different than those required to launch one.” Zenger H, et al. Making yourself indispensable. Harvard Business Review. October 2011. Change is inevitable as a company grows. Even if the company’s size doesn’t expand, the way things are run will be different in a year, compared to day one. For example, a new urgent care center in the early years may be focusing heavily on marketing and community promotion to get its name out and ramp up visit counts. In this case, a leader with strong marketing skills is indispensable. However, once that center has established itself in the community, there is not as much need for promotion and the focus will necessarily shift to improved efficiency and effectiveness in operations, leading to increased profits on those visits. So, what does the urgent care owner/operator do? They could stay stagnant with their skills of marketing and allow the organization to stall. Or, they could adapt a new set of skills that complement strengths they already have. For instance, working on innovation that allows the urgent care to run more efficiently and at a lower cost, thus increasing profits. In this way, the leader is able to continue to be indispensable no matter the phase of the business or the current situation. According to a Harvard Business Review article titled Making Yourself Indispensable, it’s more effective to complement the skills you already have rather than starting from scratch with new ones. First, owner/operators should work to identify the strengths that they currently possess. Perhaps this means problem-solving or honesty and integrity. Or, it could be initiative or technical/ professional expertise. Regardless of what skills you currently possess, the next step is to develop complementary traits. By working with current strengths, a leader can more quickly develop these complementary skills. For example, someone strong in technical expertise could work to foster problem-solving skills, effectively communicate that expertise, and display honesty and integrity in daily practice. Meanwhile, a strong problem-solver can work on taking initiative to address problems, develop long-term strategic perspective, and work on becoming more technically competent. In this way, leaders can quickly “scale up” their toolbox of skills, using existing strengths as a foundation. In any organization, it is important to stay relevant. No one wants to lose their job because someone else can do it better. In an urgent care managerial setting where turnover can happen quickly, it is even more crucial to become indispensable. The most effective way of accomplishing this is through the development of skills that complement your strengths. Not only is this method quick, it is highly efficient. Table 1 provides some examples. 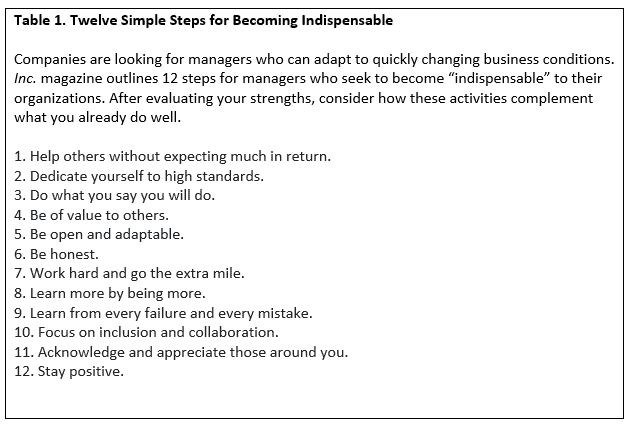 Source: Daskal L. 12 simple steps for making yourself indispensable. Inc. Available at: https://www.inc.com/lolly-daskal/12-simple-steps-on-how-to-stop-being-indispensable.html. Accessed April 4, 2019. By fostering a set of skills stemming from your main strengths, you’ll soon have multiple profound strengths that boost your leadership effectiveness score into the top decile or higher. In this way, leaders can both make themselves indispensable and make the organization the best it can be.